Can I fix a tight IT band? As with anything, relieving a tight IT band depends on what is causing the tightness, In my opinion, it’s usually related to one of the dysfunction somewhere else. What causes a tight IT band? A tight IT band, also known as Iliotibial Band Syndrome, can wreak havoc on your workout routine. The strain leaves you with sharp hip or knee pain or the inability to exercise in the first place. As one of the most common injuries for runners, it occurs when the band of connective tissue from your hip to your shin bone becomes irritated or inflamed.“Usually, hip weakness contributes to faulty movement patterns, and over time, that can cause the IT band to feel tight. The issue may be repetitive stress into a movement that’s less efficient. For example, a very common thing I see is the knee falling ward toward the other knock-knees when someone is squatting, climbing or descending stairs, walking, or getting in and out of a chair. This puts a lot of stress on the IT band and can make it feel painful or tight. Also an increase in running mileage, or an extra-long intense workout, can cause pain and swelling associated with iliotibial band syndrome. The muscle imbalances, weakness, and a loss of flexibility in the hip flexors, hips abductors, internal rotators, and both gluteus maximus and medius. Your IT band is intended to strengthen your knee, so when the surrounding or supporting muscles are tight, it forces your body to compensate—resulting in friction and compression on your knee area. The IT band originates from the Tensor Fasciae Latae (TFL) muscle and the Gluteus Maximus, so these can be two sources that refer pain down through the IT band. Make sure that you are keeping this muscle not only mobile by doing some pressure point, or foam rolling and stretching as well, will help reduce your chances of pain in the IT band. The IT band also ends at your tibia, just outside the knee, so proper joint mobility and not only the knee but also the kneecap can help. It is important to think about where the source of that pain or tightness might be coming from. How massage therapist can help your IT band? The massage therapist can help loosen it up the surrounding muscles. 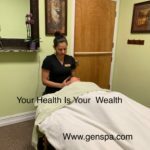 Gen Spa massage techniques will help you alleviate the tension from around the IT band and help stop the pain. We are very specific to the point to release the contracted muscles.